Many companies outsource their logistics functions to Third-Party Logistics providers (3PL) instead of achieving them internally. 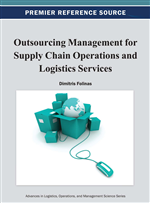 The studies on this field are mostly of empirical type and focused on reasons, benefits, and risks of working with 3PL as well as the role of those on supply chain management. This chapter focuses on 3PL selection problem and presents a literature analysis of 47 articles published within 2001-2011 period. The objective is to identify the mainly approaches applied and their evaluating criteria in measuring the performance of 3PL. In recent year, much has been written about outsourcing logistics activities, which can be defined as an activity entrusted to a third party logistics provider (3PL) instead of being achieved internally. It also involves activities carried out by a 3PL on behalf of a shipper and consisting of at least management and execution of transportation and warehousing. In addition, other activities can be included, for example inventory management, information related activities, such as tracking and tracing, value added activities, such as secondary assembly and installation of products, or even supply chain management. The 3PL providers can perform the logistics functions of their customer either completely or only in part. Currently, they have their own warehouses, transport fleets and their credits are often deployed throughout the world. Most 3PL have specialized their services through differentiation, with the scope of services encompassing a variety of options ranging from limited services to broad activities covering the supply chain. Based on a survey of 3PL users in the US, Table 1 provides an overview of the functions normally performed by 3PL (Bottani & Rizzi, 2006). Transportation Road rail air sea, intermodality management, shipping, forwarding, package express carrier, customs brokering, (de) consolidation, perishable/hazardous goods management, freight bill payment/audit. Distribution Order fulfilment and processing, picking, sorting, dispatching, post-production configuration, installation of products at customer’s site. Warehousing Storage, receiving, cross-docking, (de) consolidation, perishable/hazardous goods. Inventory management Forecasting, slotting/lay out design, location analysis, storage/retrieval management. Packaging Design, labelling, assembly and packaging, palletizing. Reverse logistics Pallets flows management, recycling, reuse, remanufacturing disposal management, repair, testing and products serving, return shipment management. Most recent studies conducted on 3PL are empirical and focus on reasons for, benefits and risks of outsourcing decision (Sohail & Sohal 2003, Sohail 2006, Hsiao et al. 2010); modeling, planning and evaluation of the integrated logistics network for 3PL (Tyan et al. 2003, Ying & Dayong 2005, Ko & Evans 2007, Min & Ko 2008, Wong et al. 2009); analysis of relationships between 3PL and their clients (Hertz & Alfredsson 2003, Carbone & Stone 2005, Panayides & So 2005, Wang, 2010); and finally on 3PL selection. The later is the objective of this paper.